Synopsis: High-school life gets even more unbearable for Nadine when her best friend, Krista, starts dating her older brother in The Edge of Seventeen. 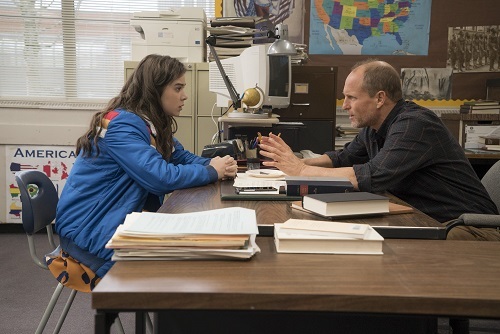 The Edge of Seventeen is about a girl named Nadine (Hailee Steinfeld from The Keeping Room and The Homesman) whose life is turned upside down at a young age by the untimely death of her father. Her one source of happiness and security throughout her childhood and up until high school has been her best friend, Krista (The Bronze‘s Haley Lu Richardson). That is until Krista starts dating Nadine’s jock brother, Darian (Blake Jenner from “Glee”). Darian pulls Krista into his world of parties and popularity – and out of Nadine’s world of self-pity and loneliness. Nadine is left to her own devices as, for the first time, she has to navigate the halls of life without the aid of her best friend and her brother. The screenplay for The Edge of Seventeen was written by Kelly Fremon Craig (Post Grad), who also makes her directorial debut with the film. At its most basic, it’s a coming-of-age comedy, a tale about high school relationships and how strained they can become when put under the pressure of growing up. It falls somewhere squarely between Me and Earl and the Dying Girl and Clueless, ripe with indie hipness but not afraid to dip its toes into brainless comedy. Truth be told, it’s not as genuine as Me and Earl and the Dying Girl, but it’s a whole lot smarter than Clueless. For better or worse, The Edge of Seventeen is completely Nadine’s story; it stays with her the entire time, and none of the other characters exhibit any story arc whatsoever. The audience is made to watch Nadine make questionable decisions and treat people poorly, all because of her frustration with her own situation. There are voices of reason in her life – her mother (The Possession‘s Kyra Sedgwick), her favorite teacher (Woody Harrelson from The Hunger Games), even a classmate who has a crush on her (Hayden Szeto from “Chop Shop”) – whose advice she promptly ignores as she runs off to learn her own lessons. There’s a powerhouse cast surrounding the lead, but the movie may as well be called Nadine on the Edge of Seventeen. Okay, so that last part is a little snarky. But The Edge of Seventeen is definitely Nadine’s (and, by extension, Hailee Steinfeld’s) movie. Everyone else, including the audience, is just along for the ride. That’s not a bad thing – it’s reminiscent of the enjoyable one-trick John Hughes movies of the eighties like Sixteen Candles and Ferris Bueller’s Day Off. It’s a refreshing, if a little safe, throwback to a simpler time. There’s nothing too heavy about it, but it will make you feel good to watch it, and who doesn’t want to feel good? As mentioned earlier, the comedy in The Edge of Seventeen walks the line between indie cool and stupid parody. Nadine’s whole character is built upon insecure sarcasm, and her attitude provides most of the good laughs in the film. While the humor is hardly highbrow, it’s not potty-level either, and it’s mostly verbal sparring as opposed to physical slapstick. 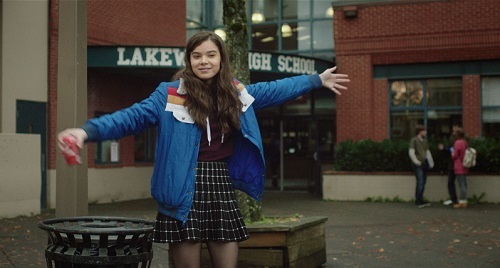 Really, The Edge of Seventeen is more smile-and-nod funny than it is bust-a-gut. It’s amusing more often than not, and these days, that’s about as much as one can ask from a comedy.